Download "Reporting to Senior HMI, Regulatory Inspection Managers will manage the activity and performance of a number of social care regulatory inspectors." 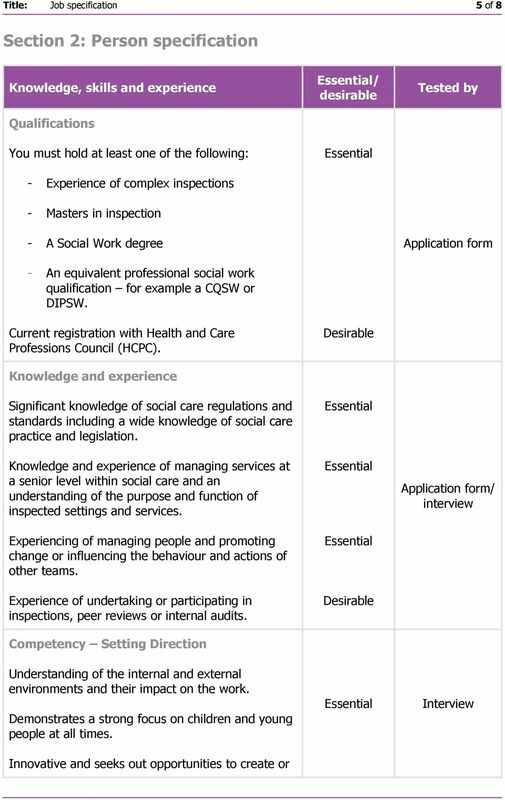 1 Job specification Regulatory Inspection Manager, Social Care Grade: Band A (Civil Service equivalent: Grade 7) Section 1: Job description Context Ofsted believes that all children and young people deserve the best. Across the whole range of education, further education and skills, and social care inspections, our frameworks are raising expectations and raising the bar. We re determined to make a greater difference: to raise standards and improve lives. It is of paramount importance to us in all our work to put the interests of children and learners and their protection first. Under the leadership of Her Majesty s Chief Inspector, Sir Michael Wilshaw, we are challenging those we inspect to improve faster. To do this we are radically changing the way we work, so that inspection can be an even more powerful lever for improvement. Overall purpose Reporting to Senior HMI, Regulatory Inspection Managers will manage the activity and performance of a number of social care regulatory inspectors. 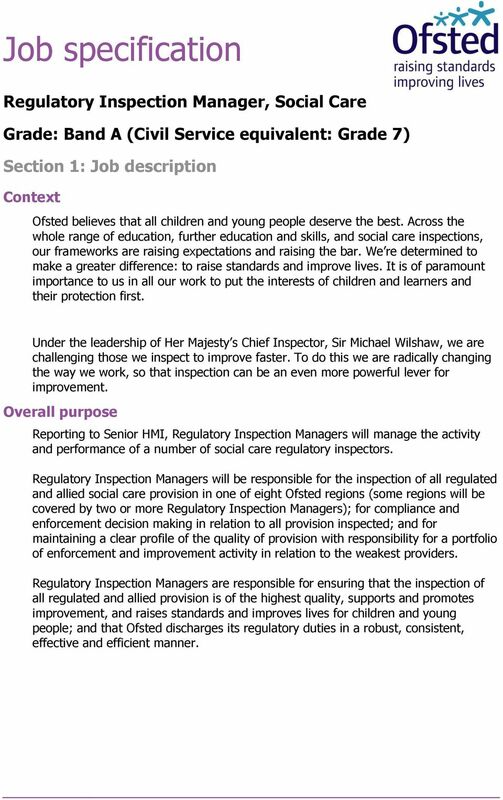 Regulatory Inspection Managers will be responsible for the inspection of all regulated and allied social care provision in one of eight Ofsted regions (some regions will be covered by two or more Regulatory Inspection Managers); for compliance and enforcement decision making in relation to all provision inspected; and for maintaining a clear profile of the quality of provision with responsibility for a portfolio of enforcement and improvement activity in relation to the weakest providers. Regulatory Inspection Managers are responsible for ensuring that the inspection of all regulated and allied provision is of the highest quality, supports and promotes improvement, and raises standards and improves lives for children and young people; and that Ofsted discharges its regulatory duties in a robust, consistent, effective and efficient manner. 2 Title: Job specification 2 of 8 Key responsibilities The key accountabilities of the role are outlined below. However, this is an overview of the role and is not exhaustive. Ofsted reserves the right to assign other duties commensurate with the grade as required. To lead a team of social care regulatory inspectors, ensuring the inspection of a range of social care providers to time and to quality. Taking responsibility for the day to day activity of all inspection staff on the team and using data to monitor and drive performance. To provide effective leadership and direction for the team, coaching, mentoring and talent managing to achieve the best outcomes for children and families. To undertake robust performance management, ensuring continuous improvement in inspection activity. To proactively and effectively support the Senior HMI and regional director in driving up provider performance in the region, working to analyse and intervene in locality issues, and reporting effectively on the position in your area. To undertake complex inspections, as required. To be responsible for the quality of reports produced by the team and to undertake quality assurance of inspections and reports produced by the team, taking remedial action with individual inspectors as required. To undertake and be accountable for training inspectors and acting as a source of technical support for them. 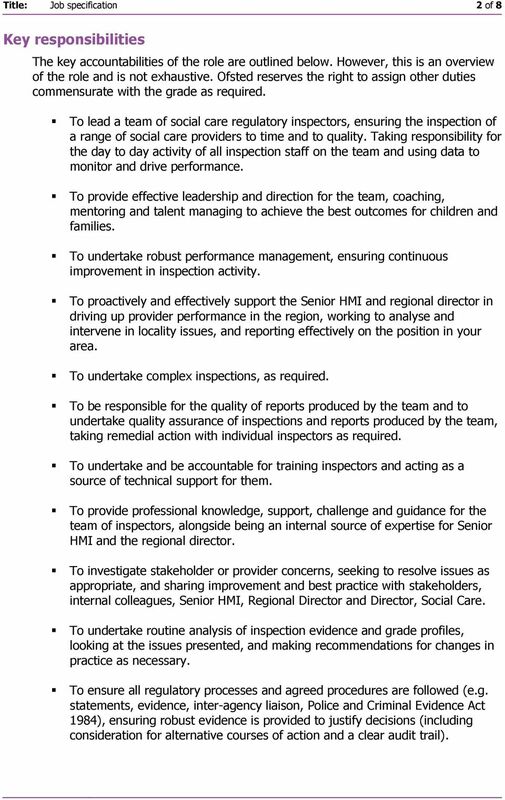 To provide professional knowledge, support, challenge and guidance for the team of inspectors, alongside being an internal source of expertise for Senior HMI and the regional director. To investigate stakeholder or provider concerns, seeking to resolve issues as appropriate, and sharing improvement and best practice with stakeholders, internal colleagues, Senior HMI, Regional Director and Director, Social Care. To undertake routine analysis of inspection evidence and grade profiles, looking at the issues presented, and making recommendations for changes in practice as necessary. To ensure all regulatory processes and agreed procedures are followed (e.g. statements, evidence, inter-agency liaison, Police and Criminal Evidence Act 1984), ensuring robust evidence is provided to justify decisions (including consideration for alternative courses of action and a clear audit trail). 3 Title: Job specification 3 of 8 To act as decision maker for case reviews relating to compliance and enforcement action, and to chair such reviews as appropriate. To represent Ofsted at tribunals. To act as independent chair of objection panels. To manage serious incidents, including coordinating and communicating appropriately internally and with external agencies, and compiling reports. To contribute to development of policy, frameworks guidance and learning resources within the organisation. To build strong relationships with other agencies and authorities and liaise with other functions within Ofsted as appropriate. To investigate and complete as appropriate, complaints against Ofsted. To respond to urgent requests for information, Parliamentary Questions, letters/fois, signing off responses and being fully accountable for the accuracy and consistency of content, alongside drafting briefings for directors and/or HMCI. To effectively represent Ofsted locally, regionally and nationally as required. Generic responsibilities To work in accordance with Ofsted s policies and procedures. To lead by example and uphold and embody our values at all times, ensuring the protection of children and learners is paramount. To contribute to organisational development initiatives as required. To adhere to responsibilities under health and safety legislation and policies. To demonstrate a positive commitment to equalities and diversity. To contribute to building a One Ofsted culture. Additional requirements of the role This is a home-based role, but substantial travelling, including some overnight stays, will be required in managing and supporting home-based staff. The role holder is required to work flexibly to meet the needs of the business and the availability of providers; this may include some evening or weekend work for example to meet with providers and children and young people in the evening or during the weekend. 4 Title: Job specification 4 of 8 Ofsted have identified this role as one which will require an enhanced criminal record check via the Disclosure and Barring Service (DBS). This role will bring you into direct contract with children or vulnerable adults, it may give you access to material or sensitive information. 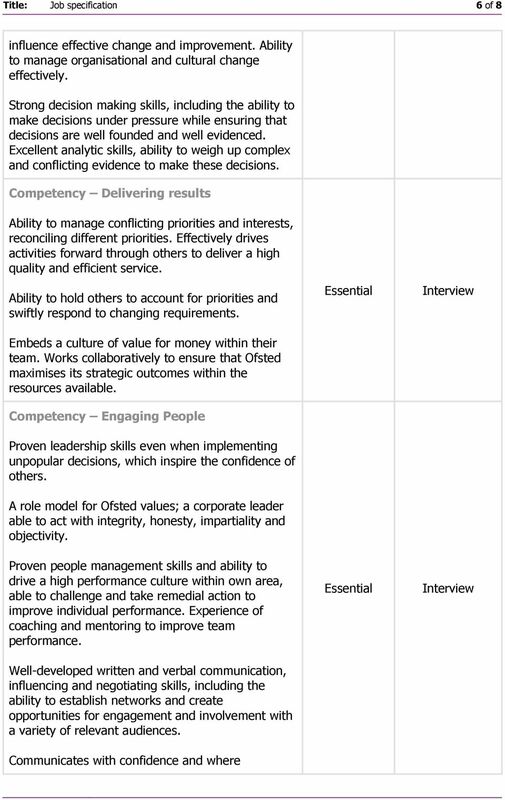 7 Title: Job specification 7 of 8 necessary challenges others, including stakeholders and providers at senior levels. 8 Title: Job specification 8 of 8 Section 3: Terms and conditions Job title: Regulatory Inspection Manager, Social Care Grade: Band A (Civil Service equivalent: Grade 7) Salary: 55,317, rising to 60,317 on successful completion of probationary period. Performance related pay and awards also available for outstanding achievement. Location: Home-based Full-time Hours: Travel requirements: Significant national travel including some overnight stays. The post holder will also be entitled to an annual home-based working allowance. Please note: Whilst this post is currently based at home, future changes may require the post holder to be based at another location. 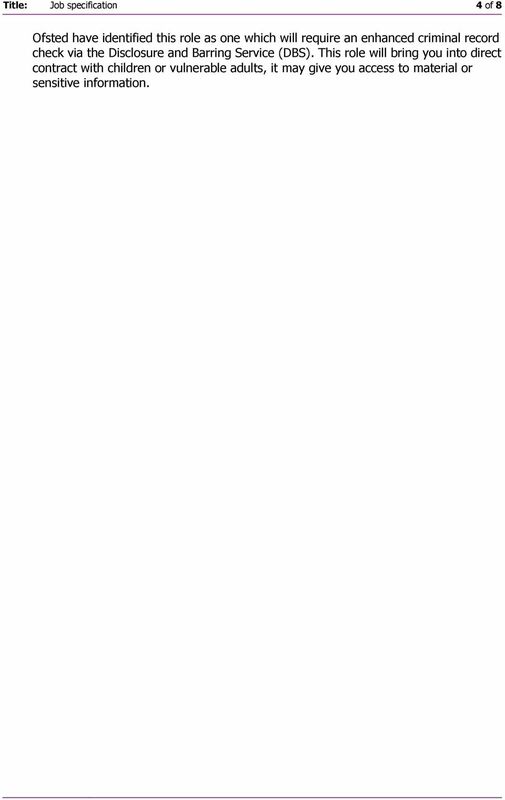 This is a non-reserved post under the Civil Service Nationality Rules and is therefore open to UK, British Commonwealth and European Economic Area (EEA) Nationals and certain non EEA members subject to immigration requirements. 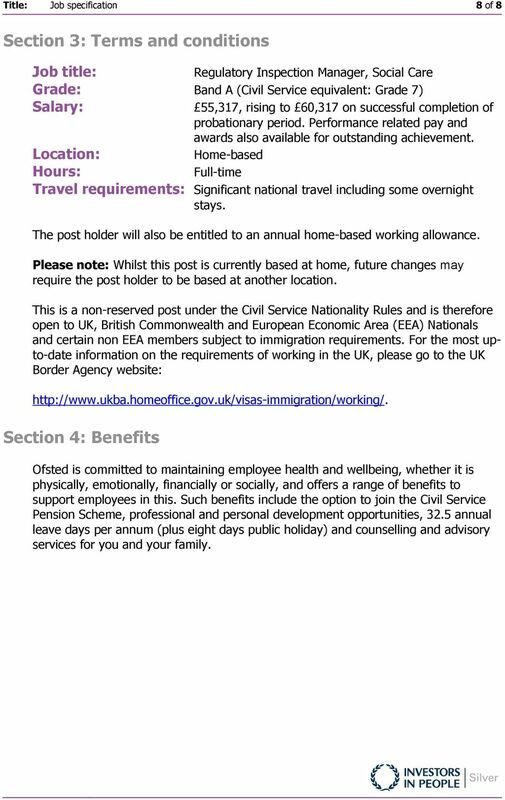 For the most upto-date information on the requirements of working in the UK, please go to the UK Border Agency website: Section 4: Benefits Ofsted is committed to maintaining employee health and wellbeing, whether it is physically, emotionally, financially or socially, and offers a range of benefits to support employees in this. Such benefits include the option to join the Civil Service Pension Scheme, professional and personal development opportunities, 32.5 annual leave days per annum (plus eight days public holiday) and counselling and advisory services for you and your family. JOB INFORMATION PACK Supported Living Officer (Out Of Hours/On Call) Permanent September 2015 CONTENTS 1. About Us 2. Summary Terms and Conditions of Employment 3. 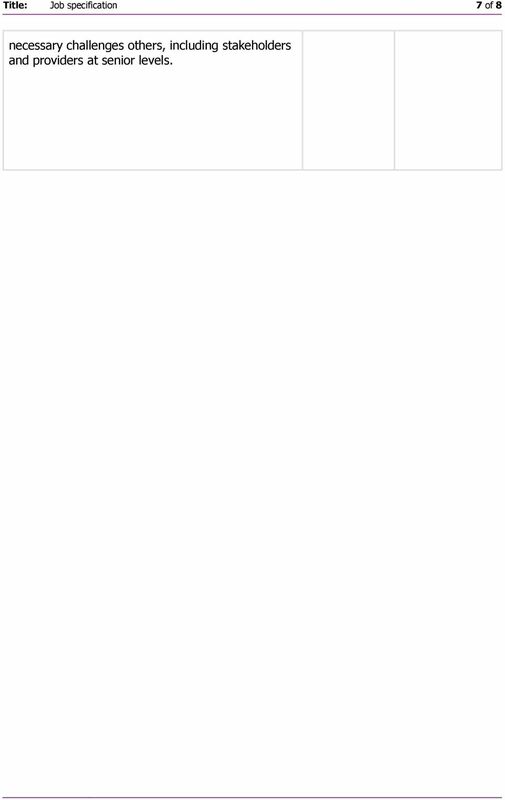 Job Profile 4. Person Specification 5.